The business case claims the development could be worth £142m per year to Aberdeen over 25 years. The business case for the controversial City Garden Project has been published - and claims the development could create more than 8000 jobs. 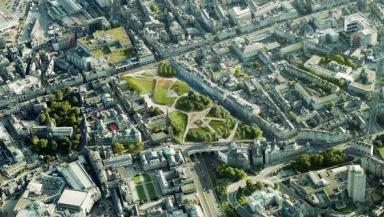 The 131-page report considers the £92m Tax Incremental Financing loan from the Scottish Government to fund five city centre regeneration projects, including the transformation of Union Terrace Gardens. Amongst the conclusions reached in the report are that the TIF business case “can be delivered” and has “the potential to unlock 8121 jobs and an average £142m per annum of economic growth over 25 years”. It adds that without the TIF case Aberdeen would see “lower levels of economic activity over the next 25 years”. However Labour group secretary Willie Young criticised the report for making “extremely extravagant claims”. He said: “I don’t think anybody actually believes that there are going to be 8000 jobs created. “We are worried that the council would become the bank of last resort as it would increase the council’s borrowing to £600m and that is unsustainable. “If the Scottish Government really thinks that this scheme is a flier then they should under-write it and not the Aberdeen City Council taxpayers. “You have to remember who has authorised this report and that it is the City Garden Project. If you authorise a report then whoever writes it has to do it in the way that you want it. He who pays the piper, calls the tune. However SNP leader Callum McCaig said the business report was a welcome boost for supporters of the scheme. He said: “I think it is overwhelmingly positive and a well-stated case which builds on the momentum that is behind the City Garden campaign. “This report reinforces the magnitude of the decision that we are going to have to take. It is crazy that we are even thinking about saying no to something that will be as beneficial as this will be. A special finance meeting is being held on August 17 - five days before members are due to vote on the future of the City Garden Project. Last week, Labour and SNP clashed over when the TIF business case would be discussed. Councillor McCaig had wanted the document to be discussed at this week’s audit and risk committee meeting but Councillor Young had said Mr McCaig would be removed from his post as convener of the audit and risk committee if he did not remove his request. However earlier this week, it was agreed that a special meeting would take place on August 17 to discuss the merits of the report ahead of a full council vote on the £140m plans to transform the Victorian park. More than 85,000 people voted in a public referendum on the contentious project with 52% voting in favour of the project. Local businessman Sir Ian Wood has pledged £50m towards the development and a further £20m is expected to be generated from the private sector. The TIF loan would be used to cover the remaining cost.